I have officially finished my winter Camino de Santiago. The past two weeks have involved a full spectrum of weather, lots of new people on the Camino, and so much walking. Check out Part 1 and Part 2 if you missed them. After Leon, I soon arrived in the mountains. As the path climbed up, the temperature went down. I was happy for the change, as the Camino is often flat and a lot of the same scenery. After a night in the village of Rabanal, I had a day of cloudy weather and snow-packed walking. For some sections of the Camino, I walked in snow that came up to my knees. I enjoyed it while it lasted because I knew I would be losing elevation at the end of the day. Hiking through the snow one morning. The downside of a winter Camino, is that bars (bars in Spain are open in the day for coffee and food; they’re not just for alcohol) are often closed for the season. After traipsing through the snow all morning, all I wanted was something hot to drink. Everything was shut down in the only village I’d seen in a few hours. We saw a lady out walking her dog, and my friend asked if anything in town was open. She just happened to be the bar owner, and opened up shop for a half hour just for us. Refueled, we continued on our way. Me on one of our snow days. The absence of snow made way for the rain. There were a few long days with similar views that were damped by foul weather. I occupied my time with podcasts to make the kilometers disappear faster. Our group was split in half for a week: three of the Italians were behind and myself, Manuel, and Enrique ahead. We also picked up a few new friends during this time, Ago and Ivan. Ago was on his sixth Camino, so he knew all the good spots. I had met him on my very first day and hadn’t seen him for a few weeks. During this time Enrique, Manuel, and I began to occupy ourselves by making fun of each other. It started because allegedly I was snoring one night, and the boys began to say I sound like a tractor. On a different day, I was annoyed with listening to them talk (these particular European men talk constantly) and I yelled at them that all they do is talk, talk, talk all day long. Hence began a long week of calling each other tractors and demanding silence at various points throughout the day. Our final day of atrociously cold and wet weather brought us to the village of O Cebreiro. Maybe it was because I was shivering when I walked into the local pub, but they had the most delicious potato soup and pork chops of the whole Camino. And there were large chunks of cured meat dangling from the rafters. Sunrise at an albergue one morning. Finally, the days began to get sunnier and warmer. A few days were even warm enough for me to hike in my tank top. O Cebreiro had been a cute town, but the albergue was packed with about 30 people. (Side note: if you’re a summer pilgrim you’re probably rolling your eyes right now because you’ve seen albergues legitimately packed). Approaching Santiago, more and more people jump on the Camino to do shorter walks. After O Cebreiro, we tried to stay in smaller villages where there wouldn’t be quite so many pilgrims. One day, we carried grocery bags for 4 kilometers so we could cook dinner at an albergue in the middle of nowhere. The following day, we weren’t so smart. The only restaurant in the village of Morgade (right at the 100k mark) was closed on Tuesdays, the one night we were there. After talking with some locals, Enrique arranged for a taxi to deliver us sandwiches from a restaurant in a different town. Wanting to avoid situations like that in the future, we began staying at the more popular stops again. Finally got to enjoy some warm, sunny weather on the Camino. Somewhere around the 100k mark, the trail began to get ridiculously well marked. There were stones regularly counting down the distance to Santiago de Compostela. This sounds like it should be a good thing, but the down side is the frequent reminders of how far there is to go. I was anxious to finish because I was tired of walking. My feet were sore and I had listened to the music on my phone too many times. But I also didn’t want to finish because there is an element of purpose that comes with walking towards a particular destination day after day. What would my daily purpose be after the Camino? Enrique, myself, and Manuel in Santiago de Compostela. The final day arrived. I awoke in the morning to walk the last 18 kilometers with Enrique and Manuel. The morning went by quickly and easily. Before I knew it, we were in the city walking towards the towering cathedral in the distance. Finally, I was in the cobblestone square in front of the Cathedral of Santiago de Compostela, the place I had walked 500 miles to reach. I wish I could say I was overcome with emotion or had some significant revelations about myself, but I typically feel pretty anti-climactic in big moments. I’m a generally under-whelmed person. I laid on the warm stones in front of the cathedral for a bit. People looked at us and asked if we were pilgrims. A Japanese tour group took a particular interest in Enrique and snapped some photos with him. There’s an option to continue on for another 90 km to the ocean to the town of Finisterre. I chose not to because I wanted to spend a few days in Portugal. The guys wanted to continue, and because of their flights could only spend one night in Santiago. I enjoyed the last of my time with them in the evening. I got out of bed in the morning to give them hugs and say my last goodbyes. About two hours went by before they started leaving me messages, “C’mon, Megan. Andiamo. Vamos. Let’s go.” The impulse was there to hop on a bus and go meet them, but I resisted. I do want to see Portugal after all. After reading all this, what do you guys think? Would you ever do a winter Camino de Santiago? No, I am a fair weather hiker! Congratulations. I too was underwhelmed when I arrived in Santiago, and said I’d never walk it again. In a couple of months I was planning for Caminho Portugues and then I walked 1/2 the Camino from Le Puy in France. I’d be interested to hear your post-Camino reflections in a month or two. Your story is well told and illustrated, thank you. Don’t think I could handle the bone chilling cold and wet for so long. Congratulations ! That’s so true. I was always grateful for my hot shower at night. Oh Megan, thanks for living your (and my) best life so I can read all about it. You’re amazing! I would walk the Camino when opportunity presented. But not more than once. Too many other fine trails in the world to be explored! I agree. Maybe someday I’ll do another Camino, but there’s lots of other things I want to do first. Congratulations Megan! I am glad you had an enjoyable and safe Camino! My husband wants to do a winter camino, I’m from the Caribbean, I don’t know if I’m brave enough! Congratulations! Thanks for sharing your experiences and Buen Camino! 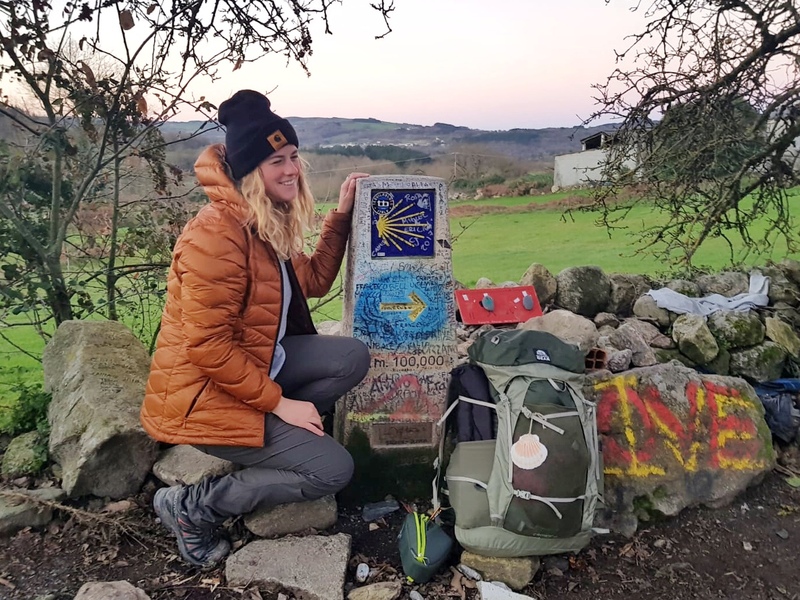 I thought that upon getting to Santiago I was going to have a revelation, or learn something new about me, but most important, was see the friends I made on the camino get to Santiago. The saddest part was, that I knew, that I was not going to see most of them ever again. It’s been almost five years from our first camino and we are still in touch with some of then! Visit some and also had some visit us! What else can I ask?! That’s so good to hear that you keep in touch with some of your Camino friends. I really hope that’s the case for me 5 years from now. This kind of reminds me of The Crossway by Guy Stagg. He hiked what was essentially a pilgrimage route (from Canterbury to Jerusalem) but had similar thoughts about not really ‘feeling’ anything at what were supposed to be key moments along the route. I guess in effect, these routes aren’t particularly religious anymore and could be called more of a ‘historical trail’ than an actual pilgrimage. I met other pilgrims who treated it as a religious experience. I think if that’s what you’re looking for you can find it. I don’t have much of a religious background though, so I guess that’s not really why I was there. I’ll have to check out that book.